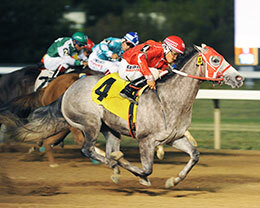 Dak, under jockey Nestor Duran, winning the $479,196 TQHA Sale Futurity (RG3) at Retama Park Saturday night. SELMA, TX—JULY 28, 2018—Trainer Leon Bard qualified three finalists to the $479,196 TQHA Sale Futurity (RG3) at Retama Park, and had a stellar showing with each of his juveniles. It was Blue Star Racing’s Dak, with confident handling by jockey Nestor Duran, who bested his stablemates at a big price! Bullard Farms bred Dak, a son of Dominyun out of the Fishers Dash mare Fleet Els broke his maiden in trials on July 13, which was just his second start. He went to the gate as the ninth-fastest qualifier at odds of 16-1, but showed his tenacity in the final strides, drawing clear by a half-length over LJ Moonrise. He covered 350-yards final in :17.888 seconds over a fast track, earning a 99 speed index. LJ Moonrise, also trained by Bard, was a game runner-up, closing powerfully from the far outside post under jockey Jose Alvarez. A filly by Separatist owned by P and D Racing, Ltd, she was the third-fastest qualifier heading into the final. The speedy filly earned $105,423 for her runner-up finish tonight. A $22,000 TQHA Sale graduate, LJ Moonrise is out of the One Famouus Eagle mare Risen Eagle. Elizabeth Vivanco is the breeder. Gerardo Aguirre’s Hot Beer, with Manuel Gutierrez in the irons, ran third. Trained by Juan Diaz, Jr, the gelding by first-crop sire Dash Master Jess was the tenth-fastest qualifier. He was making just his second career start this evening. Out of the Azoom mare Kanzoom, Hot Beer was bargain $3,600 TQHA Sale graduate. Bred by Bennie and Jeri Jeter, the bay gelding earned $52,711 for his effort. Jockey Francisco Calderon, who rides first call for Bard, ran fourth on Woulda, who is bred and owned by P and D Racing. Sired by Tempting Dash, Woulda broke his maiden at Sam Houston Race Park and was the sixth-fastest qualifier. Coronas on the Coast and Dash Master Angel dead-heated for fifth, followed by Baller, Anasttasia, Gianni Moons and Dashingwithnorate. The winner paid $34.60 and earned $213,242 for the victory. With two wins from three starts, he has earned $215,392 for his connections. This was the fourth TQHA Sale Futurity victory for Bard; he won with Silver Gol in 2005 with Grey Daze in 2015 and last year with Just Another Natural. Purchased for only $14,500 at the TQHA Yearling Sale, Dak is another example of why the annual sale continues to offer excellent value for prospective owners. Past successful sale graduates include Oak Tree Special, Azoom, Snowy Alibi, Jodys Money Pop, Triple Vodka and Duponte. The Bobby Cox bred the Duponte, who was purchased for just $6,700 in the 2015 TQHA Yearling Sale, won the Grade 3 Harrah's Futurity and $1.1 million Grade 1 Heritage Futurity.